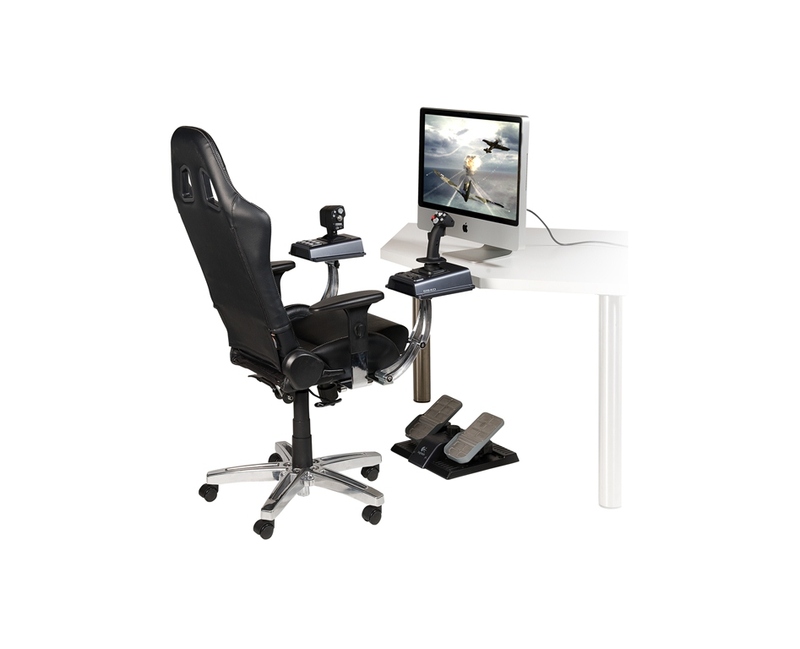 Luxurious, work-oriented office chair transforms into a racing or flight simulator in seconds. Features fully adjustable anodized aluminum gaming arms for placement of your gaming peripherals. Chair is supported by an extra strong, heavyweight, powder coated steel swivel chair mechanism. Height adjustable gas spring mechanism and anodized aluminum legs with caster wheels. Seat is upholstered in a high quality black synthetic leather. This dynamic, office oriented seat shares the eloquent styling of the Playseat line, giving it a sophisticated design to use wherever you work or study - when the work is done, the Office Elite is ready to dominate lengthy MMORPG or FPS gaming sessions with simple attachment of the dynamic Office Elite A.A.R.M.S. (Anodized Aluminum Re-adjustable Mechanical Surfaces)! Easily interchanges from a luxurious everyday office chair into a dynamic gaming seat in seconds with the attachment/detachment of the dynamic, fully adjustable anodized aluminum gaming arms, which allows for perfect ergonomic placement of your gaming peripherals at hands length! The seat's base support is anchored by an extra strong, heavyweight, powder coated steel swivel chair mechanism with a top quality, height adjustable gas spring mechanism and anodized aluminum legs with caster wheels to get around your desk space with ease. For home or office use, but also great for showrooms, meeting rooms and lounge areas as well! *Note: The Playseat hardware support plates are manufactured with pre-drilled holes to accommodate most Logitech gaming peripherals available on the market exclusively. Industrial strength velcro is included with this set to attach other 3rd party manufacturer peripherals (Thrustmaster, Fanatec, etc.) to the Playseat support plates when the pre-drilled holes do not align with the hardware. Please contact the manufacturer with questions regarding 3rd party peripheral compatibility with Playseats. Controllers and TVs not included - obviously.